Taking a dig at the much-hyped Darbhanga visit of Yogi Adityanath, Nitish Kumar said, "He must be coming empty handed whereas I am here to launch various development schemes." Nitish Kumar also took a dig at PM Modi for not fulfilling his promises made to Bihar. As Yogi Adityanath gets ready to visit Bihar today, Nitish Kumar has a message for the Uttar Pradesh Chief Minister: "Do not come empty-handed." Just like his state, Yogi Adityanath should first implement liquor ban and 50 per cent reservation for women in local bodies, says the Bihar Chief Minister. "You (Adityanath) should take cue from us and implement liqour ban and 50 per cent reservation for women in local bodies," Mr Kumar said at a public meeting after laying foundations of development projects worth Rs 300 crore in Darbhanga, about 125 km from state capital Patna. Taking a dig at the much-hyped Darbhanga visit of Yogi Adityanath, Mr Kumar said, "He must be coming empty handed whereas I am here to launch various development schemes." 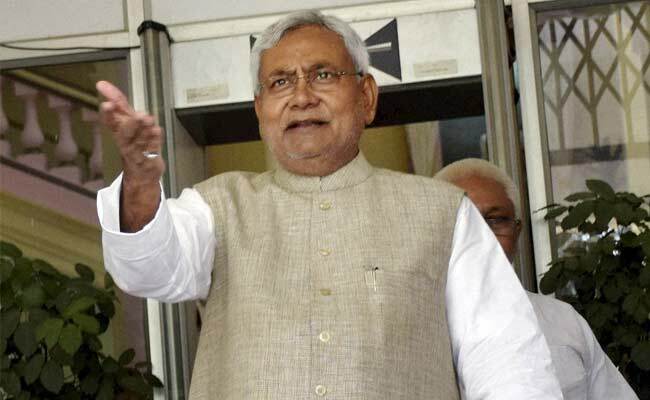 The chief minister also took a dig at Prime Minister Narendra Modi for not fulfilling various promises made to Bihar during the 2014 general elections and assembly polls in the state the next year. "We implement whatever works we promise, but others forget about it," he said. Mr Kumar also took a jibe at cow vigilantes and said they should learn to take care of stray bovines before taking law into their own hands to deal with those involved in trade of animals. He claimed that the liquor ban has become a runaway success in Bihar and asked BJP-ruled states to follow suit. Mr Kumar said that his government will launch a total de-addiction drive as follow up action after the success of liquor ban in the state.